Did you know that we spend a third of our lives sleeping or at least trying to do so? It’s such an important part of our lives, and it affects our physical and mental health. For you to enjoy each day, you must have a good amount of sleep. And for you to enjoy your sleep, you must not underestimate the importance of a good and healthy sleep environment. This is important because having a good sleep environment helps you quickly transition to rest. Your room must make you relaxed and peaceful. A cluttered and untidy room induces anxiety and makes you worry. It stops you from sleeping as it represents loose ends and unfinished business. The more clutters you have, the less freely energy can flow throughout the room. So rooms should be tidy and clean. Select wall colors and decorations you love. Make your bed every morning. This helps to regulate your body. It stimulates your brain and prepares you to sleep. Use darkening shades and curtains to keep your room dark while you sleep. It has been observed that we sleep better without light as it allows the body to produce soporific hormone melatonin. Most people don’t like to sleep where there is noise as it interrupts their sleep. We want to all sleep in a quiet place. Keep TV and radios off because of their changing tones. When you hear the noise, you may not become fully conscious, but you certainly will come out of the deeper stages of sleep and this interrupts you from your sleep. Where the noise is too much, some may benefit from white noise – using a fan or sound conditioner that creates consistent and soothing sound all through the night. 4. The temperature of the room – a cool room preferably. Most people prefer to sleep in a slightly cool environment. Typically, between 60 to 67 degrees makes the best sleep environment. Heat will wake you from sleep or even prevent you from sleeping. 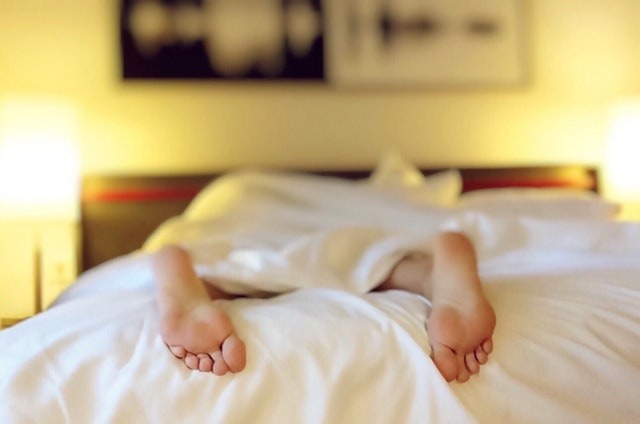 If you experience insomnia, it can even be helpful to take a warm bath or shower in the hour preceding bedtime as cooling off may help the transition to sleep. 5. Choose bedding, mattresses, pillows and sheets. As the bed is the focal point of your room, you should pay more attention to ensuring it is comfortable for you. Things to consider include your mattress, pillows and bed linen. You should make the decision according to your own preferences and sleeping conditions. Consider the size and firmness of your mattress and pillow. And don’t underestimate how your sheets affect the quality of your sleep. Choose sheets that feel right against your skin and also take into consideration the current climate conditions. Recently bamboo sheets have become very popular as they are hypoallergenic, breathable and can be used all year round. For those that are interested in learning more, Milky Sheets have provided this guide on the benefits of bamboo sheets. The ideal bed position is as far away from the door as possible, but with the ability to see it. This position also helps minimize light and noise. There should also be sufficient room around the bed to exit comfortably on either side. 7. Surround yourself with scents you like. This is another great tip and has been proven to be very effective according to a recent survey conducted by the National Sleep Foundation. It decreases your heart rate and blood pressure and also puts you in a good mood. By following these steps and taking the time to design a very healthy sleep environment, you will see improvements in the quality of sleep.